The last couple of weeks have been filled with a wealth of baby activities for me. I have been working on the nursery for the last few days. I received my baby bedding and am so thrilled with how it looks. The bedding was made by Kimberly Grant and is called Zoom Zoom. It was even cuter in person than what I picked online. I also painted the pictures you see on canvas. I saw some online and decided I could make them myself...and so I did! I am pleased with how they turned out. I still need several things...baby changing pad, diaper caddy...things of this nature, but I hope to get some of those goodies at my shower. By the way, my sweet sister has stepped up to plan my shower for this little guy. I will be having a shower on Saturday, March 27th at 2:00 pm. I am so excited! I have also been to the doctor again. I will be 29 weeks pregnant on Monday, February 22nd. For those of you who may not know, this little guy is attached to a two vessel isolated chord. Basically, the umbilical chord only has two vessels instead of three. 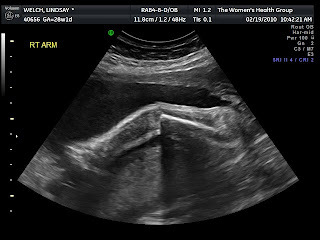 My doctor does not seem concerned, but this can cause low birth weight, so I will be having a sonogram each visit to make sure our little guy is swimming in enough fluid and growing strong. My Momma, Daddy and baby sister came to visit this weekend...and were there to see our little hero on video. Baby Mason is now 2 lbs 10 oz. He is in the 54th percentile in growth...which is good. He had healthy blood flow coming through the chord and a strong little heart rate. 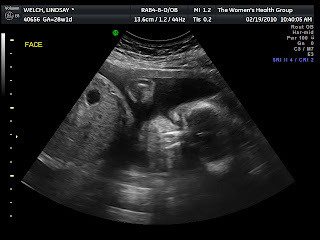 I was shocked to know they could tell all this from the sonogram. I am scheduled for another showing March 12th. This means I am now down to the two week appointments for a couple of times and then I will start my weekly visits before having the c-section. I have just 9 short weeks left! I have attached some baby photos for you to see our little man. The pictures will show fewer and fewer details as he and I run out of room for him! So, enjoy these while you can. By the way, we did prove once more that he is indeed a little boy. This baby was face down with his legs spread out like a little frog. Obviously he is not a modest little fella! 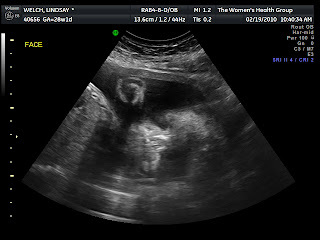 Jeremy was able to call in on Friday just before the sonogram. I was pleasantly surprised to hear his voice. He has been doing a lot of travelling in the last week, and I had not heard his voice in a while! He was still not back to his original destination, but being the super dad that he is, he made it his mission to find a phone and check in. Please continue to pray for his safety as he moves around in country. Hopefully he will return to a solid internet connection in his room. We have yet to webcam since his internet options are rather limited and the connection in his room has yet to work. This is why he has not been able to update his blog or facebook with friends. Just keep checking in and hopefully he will be up and running soon. I suppose that is all for now. More soon! The nursery is beautiful...who knew you had it in you to make such an awesome BOY room : ) It thrills me to hear that things are going well Lindsay! Keep up the good work lady! !